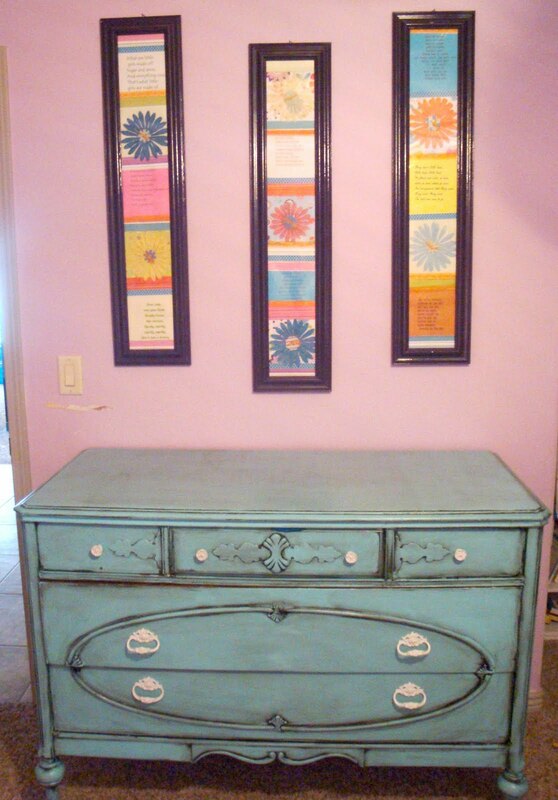 I have been wanting a dresser for my daughters room for a while. She is three so for about three years I have need one lol! I finally found one at a yard sale. They were asking 75 for this but I got it for 50! That is an awesome deal for this beauty. This dresser is very well made. That is one thing you will need to look for when buying older used furniture. Plus it has wheels which makes me very happy, because I'm always rearranging. Okay so depending on the piece of furniture you will have to decide if you need to sand or not. In this case I didn't need to. In fact I usually don't sand unless it is very prickly. If the furniture had lots of varnish on it you might want to primer. I did use primer on this project. I used kilz primer. I took off all the hardware and just spray painted them white. I love to do this because then you don't have to go buy different hardware. Plus I usually like the look of it just not the color. Then I just painted on the blue pain. I had used leftover paint from a different project. Then I used my Ralf Lauren glaze in black. I love how this turned out! It goes so good in my daughters room. Hope you like it too! So jealous! It turned out really cute and I have also been hunting for dressers for years! Um... I'll take two! Seriously Kassi- that looks amazing! I have to say you are really a talented girl! I love to check out your posts! I love the dresser! So cute Kassi! LOVE this...remind me again what you put on your table for a clear protective coating. jessica try Minwax Polycrylic gloss, I never ended up putting anything on mine because I want to do another coat of paint(someday) but when I do im going to use that.